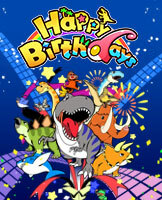 Happy Birthdays | NIS America, Inc. Create any world you can imagine! From staggering mountains and sprawling forests to a deep sea dotted with islands, there’s no limit to your creations. Discover the history of everything as you foster life of all shapes and sizes – from single-celled organisms to complex multicellular life, including plants, mammals, dinosaurs, and more! Imagine, Experiment, Create! Shape your planet and decide how plant and animal life evolves. No two planets will ever be truly alike. © ARC SYSTEM WORKS/TOYBOX Inc. Licensed to and published by NIS America, Inc.